As someone whos life has been touched by the tragic effects of cigarette smoking, I was saddened last week when the Supreme Court barred the FDA from regulating cigarettes. About 48 million adult Americans smoked cigarettes last year, according to the CDC. Thats one in four people, a fact that astonishes and alarms me. Why? Because this year an estimated 180,000 people will be diagnosed with lung cancer in the United States, and 90% of them will die within three years — and 96% of these cancer victims are cigarette smokers. Is there a cause-and-effect connection between smoking cigarettes and lung cancer? Two years ago, I wrote my first columns for the Post Dispatch, explaining the scientific evidence that cigarette smoking causes lung cancer, and that cigarette smoking is addictive. If these two points are indeed true, then cigarettes , so much a part of American life, are in fact an addictive deadly drug! In the hope of encouraging readers to urge congress to act, I am reprinting these columns. In todays column we will follow the trail of evidence that proves clearly that smoking causes cancer. In next weeks column I will examine the evidence that smoking tobacco is addictive. Over the next two years, Wynder doggedly reviewed records to see if there were other cases linking cigarettes and lung cancer. He found that many lung cancer patients were smokers. Interviewing lung cancer patients and “control” patients with other cancers, far more cancer occurred among the smokers. Early in 1950 he published his results in the Journal of the American Medical Association. Comparing 649 lung cancer patients with 600 controls, he found lung cancer an incredible 40 times higher among smokers, with the risk of cancer increasing with the number of cigarettes smoked. Later that year, Richard Doll, a well known British scientist, reported an even more convincing finding linking smoking to lung cancer. Over a period of years, Doll had interviewed quite a large number of physicians, inquiring of each about their smoking habits — then waited to see which ones developed lung cancer. Overwhelmingly, they were the smokers. Because it was not “after the fact”, Dolls test of the smoking causes cancer hypothesis was particularly rigorous and powerful. From that day forward, the scientific case linking smoking to lung cancer has been clear-cut. Cigarette manufacturers were not convinced by these relationships, however compelling they might seem, and continued to argue that the causal connection between lung cancer and smoking had not been proved. In a long series of court cases — all of which they won — the cigarette manufacturers never backed away from their claim that these relationships were coincidental. With the “War on Cancer,” scientists began in the 1970s a frontal assault on the problem of what causes cancer. Some data pointed to viruses as a potential cause, while other data implicated chemicals of various kinds. Over the next twenty five years, hundreds of laboratories bore down on the problem, and gradually a clear picture emerged. 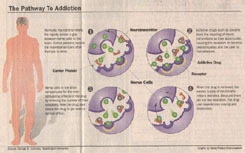 Cancer, it turns out, is a defect in the system cells use to control how frequently they divide. A battery of critical regulatory genes control this process in much the same way you control the speed of a car — some genes act as accelerators, others as breaks. Cancer results when a gene mutation occurs that stomps on the accelerator or removes the breaks. The first cancer to be studies in molecular detail, a form of bladder cancer, proved to be a point mutation in a gene specifying a protein that was part of a cell division accelerator. The tide turned in 1998. Scientists studying a tumor suppressor gene called p53 demonstrated a direct link between cigarettes and lung cancer. p53 is the cells error-detecting system, proofreading the DNA before cell division to make sure there is no damage. When it detects DNA damage, p53 halts cell division and stimulates DNA repair enzymes that fix the trouble. Mutations that inactivate p53 remove a key barrier to unrestricted cell division. p53 is inactivated in 70% of all lung cancers. A puzzling discovery was that the p53 mutations in cancer cells almost all occur at one of three “hot spots” within the p53 gene. The key link that explains the “hot spots” and links lung cancer to cigarettes is a chemical called benzo (a) pyrene (BP), a potent mutagen released into cigarette smoke from tars in the tobacco. The epithelial cells of the lung absorb BP from cigarette smoke and chemically alter it to a derivative form, benzo (a) pyrene diol epoxide (BPDE). BPDE binds directly to the tumor suppressor gene p53 and mutates it to an inactive form. 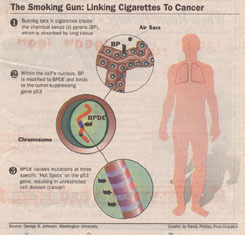 The key evidence linking cigarette smoking and cancer, the “smoking gun,” is that when the mutations of p53 caused by BPDE from cigarettes were examined, they were found to cluster at precisely the same three specific “hot spots” seen in lung cancers! The conclusion is inescapable: the mutations inducing lung cancer are caused by chemicals in cigarette smoke. Faced with this new incontrovertible evidence, the tobaccco companies have abandoned their claim that cigarettes have not been shown to cause cancer. 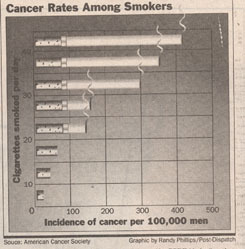 Clearly, the best way to avoid cancer is not to smoke. While one cigarette is not likely to induce cancer, the accumulated risk of many cigarettes progressively increases the odds of disaster. Imagine locking yourself in a dark closet with a companion armed with a pistol. You spin the companion to mask your location, then say “Shoot!” What are the odds you will be hit by the bullet? Not great. How many times would you let your companion shoot? Every cigarette is one more shot at p53. I started smoking a pack of cigarettes a day when I was 13, and quit when I was 30. That’s some 120,000 chances I took. How could I have been so stupid? I wasn’t unaware of how dangerous my habit was. I just couldn’t quit. In next week’s column I will explore why.